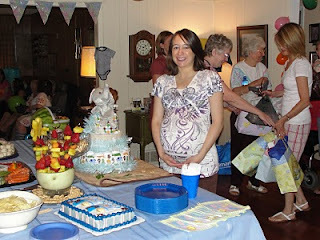 Me with the gorgeous spread, including the amazing diaper cake, fruit kabobs, cake, vegies, and mini cheesecake pieces. Very yummy. 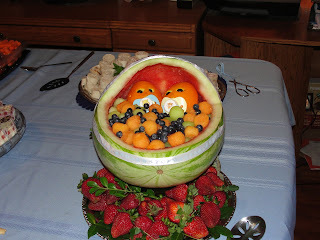 The very creative fruit bowl that my mom made. Aren't the little orange babies adorable? Opening up some presents. Lori on the far right (with the red dress) made the beautiful diaper cake! 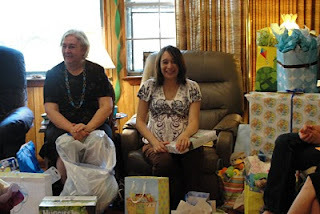 My mom and me with presents everywhere! 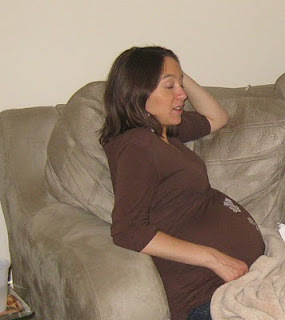 I included this one because it's a good side shot @ 29 weeks. Just ignore my expression please! On a side note, there is no longer any "innie" to my belly button. But I still don't think it's quite an outie, except for the top flap that is sticking out, lol. Alan and I. 28 Weeks. An unposed shot, but the best sideview I have at 28 weeks. Baby A weighs: 3 pounds!! Baby B weights: 2 pounds 12 ounches! They are huge. The average weight of a 28 weeker is 2 pounds 4 ounces. Mine are about the size of 30 weekers. The amniotic fluid level for the twins is the best level my ultrasound tech had seen in a while, she told me. She says for twins she's been seeing 9 and 10 (which is the lower end of normal). My twins had levels of 14 and 18. Yikes! No wonder I look like I'm 40 weeks pregnant. 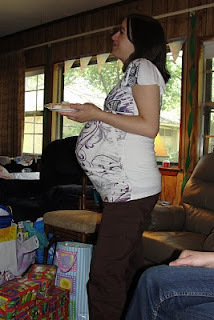 The twins are no longer positioned in the nice perfect head down position they were at 24 weeks. Both babies are diagnal/transverse. 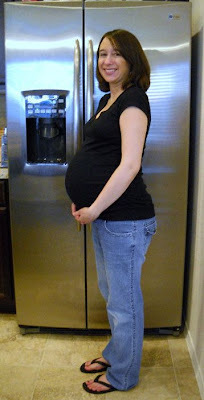 Baby A's head is tilted down (on the left side of my body) with his body toward the right side of my rib cage. Baby B is kind of on top of him, but he is tilted head up. He is flexed so that his head and his feet are both close to my rib cage. (On my right side). No wonder I have been so confused about who is kicking when. Also, I've been feeling a lot more movement on my right side than on my left. No wonder, since all of the feet are on my right side! Impromptu trip to the doctor & Baby Shower Pool Party! Last week I started getting concerned because these contractions seemed to be coming more frequently than I thought was normal. I decided to time them for an hour. I got 6 in an hour! (They weren't every 10 minutes.. it was more irregularly spaced.. 5 minutes, then 15, etc). I waited a few hours and then counted again, and I got 5 in an hour. I decided not to do anything right then, since I had no other symptoms and they weren't regular or getting more frequent. I walked over to get checked (to make sure I wasn't dilating or effacing). And the verdict is... 5cm dilated! Ok just kidding ;) I wasn't dilated or effaced at all.. which really made me feel a lot better. I did come back and tell my podmate I was 5cm dilated, and she did believe me for a second. My doctor laughed at me though, because I tried to wrap the modesty drape thing they give you around my hips & I ended up tearing it because it was too small. She said it's only the people who were skinny that try to wrap it. She told me I'm not skinny anymore! Way to rub it in doc ;) I honestly thought the drape looked plenty big enough to wrap, so I guess I am in denial about how large I really am. I still have the braxton hicks contractions every day (and night), but I'm not worrying about them as much as I was, since I know after all those weeks of having them, they aren't causing me to dilate or efface at all. Next appointment I am getting another ultrasound, woohoo! I love, love, love feeling and watching my babies move. It is the best thing about being pregnant. Today they have been especially active. One of them has to be practicing somersaults in there. 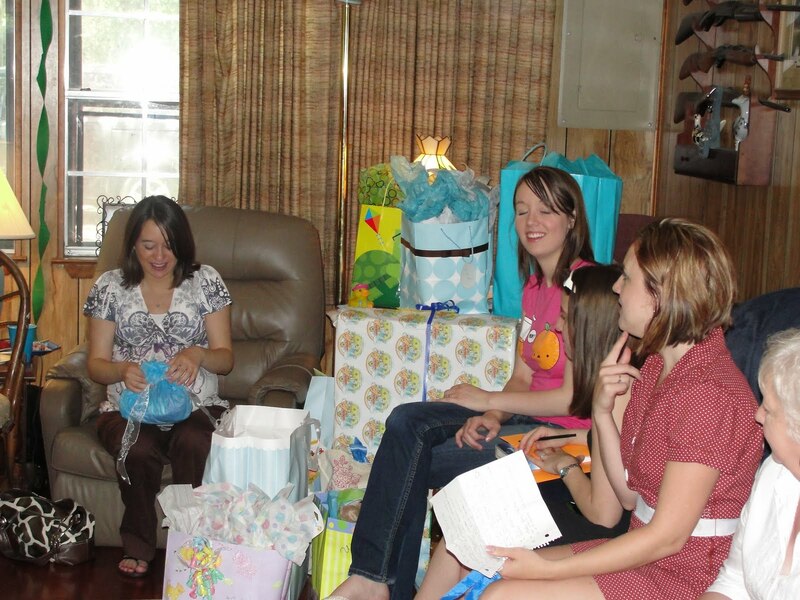 I never thought this would bother me, but I now dread when strangers ask me when I'm due. I can see in their expression that they expect me to say "Oh, in about 2 weeks." When I tell them early September, their eyes (without fail) widen and they say something like, "wow, you're going to get huge" or "really? It looks like you've already dropped." Now, I really don't mind when I get comments like this from people I know. However, when strangers ask, I feel obligated to then say I'm having twins so maybe their eyes will relax just a teeny bit. Then I always end up hearing a story of a twin in their family. Really I am just trying to get some groceries people! I have noticed myself getting a little more moody lately. Sleeping is requiring more and more creativity. Two nights last week I actually slept in the recliner in the living room, because I couldn't get comfortable any other way. I have lots of pillows, and it seems I have to adjust their positions every night.. maybe because I am growing daily?